Before moving to Australia, my parents always said to me that the moon was bigger overseas. It seems that they are right. The moon looks brighter and larger due to no high-rise buildings around blocking the view. I found the eggplants here are very big as well. The one I made lasagna was nearly 1 kg. It’s a giant eggplant indeed. My daughter is a big fan of eggplants, big or small ones are on the top list of her favourite vegetables. This lasagna was made the other day to ease her cravings. She nearly finished one whole tray by herself. I guess she was very pleased and satisfied. I used fresh lasagna sheets made by my pasta machine. To make fresh lasagna sheets by scratch is much easier than I thought, just took a bit longer time to get them ready. No need to cook them in water in advance. What I needed was to roll them in the right size, placed in the baking tray with sauce, then that’s it. If you’d like to try this recipe and are too busy to make lasagna sheets from scratch, you might substitute the dried ones bought from supermarkets. I tried San Remo’s Instant Lasagna sheets, needless to pre-cook, the end results were good. Thus, I keep a packet of it in my pantry to back up for a lazy day. You might’ve noticed that I used soy sauce to marinate the beef, that’s quite a deviant way of cooking an Italian dish. In response to the trend of making crossed-over, fusion cuisine in Hong Kong, I made a little tweak in preparing the beef. The soy sauce acts like an umami enhancer, bringing up the sauce to another tasty level. Mix the beef with the marinade. Set aside. Preheat oven to 180C/356F. Heat oil in frying pan. Add onion and sauté over medium-high heat until translucent. Add the garlic and cook until fragrant. Add beef and cook until browned, stirring and mashing with a wooden spoon to separate any lumps. Pour in the two cans of diced tomatoes with juice. Stir in ketchup, Worcestershire sauce. Sprinkle ground nutmeg if desired. Bring it to a boil. Reduce heat to simmer until the sauce thickens, about 15 minutes, with occasional stirring. Season with sugar, salt and pepper. Remember to taste by yourself, adjust seasonings until satisfied. Add the thickening and cook to preferred consistency. Turn off the heat, stir in the basil leaves. Set aside. 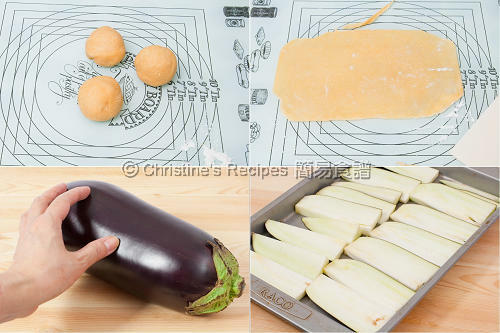 While cooking the sauce, rinse the eggplant and wipe dry with paper towels. Slice into about 1cm thickness. Brush oil and season with salt on both sides. Bake in the preheated oven, for about 10 minutes. Turn to another side, and bake for another 10 minutes. Set aside. Line eggplant slices on the bottom of two baking trays. Spoon about 1/6 of the beef sauce over the eggplant, topped with a lasagna sheet. Repeat layers for both trays, ending up with three layers each. Top with remaining sauce and cheese. Bake in the preheated 180C/356F oven, for about 20 minutes. Increase heat to 200C/395F, bake for another 8 to 10 minutes, or until cheese is golden. Serve hot. Eggplants go very well with beef. You can adjust the amount of the eggplant if desired. You might like to turn this dish into a vegan one, just skip the beef. Or add more favourite vegetables if you like. If only vegetables are used, the sauce still tastes wonderful with them. While baking for the last 10 minutes, don’t leave the lasagna unattended. Watch over the cheese on top as it easily gets burned. If there’s any leftover, it can be kept for a few days in fridge, three weeks in a freezer. Looks very delicious! I love the fact that u made the lasagne sheet. I think it's great that you marinated the beef in soy sauce! If restaurants can add asian twists to food and call it "fusion", and charge us crazy prices, then we can do it at home too!! 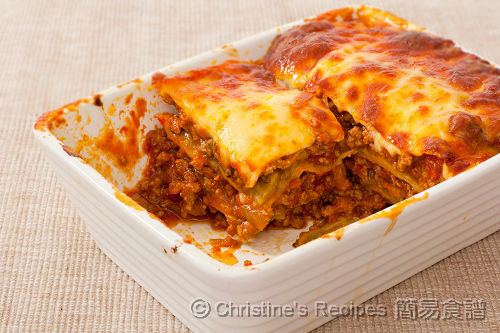 :) This lasagna looks wonderful... comforting. Looks really delicious! I'm a big fan of egg plant too, it's simply tasty and nutritious! I love eating lasagna now and then, yours looks really appetising!! wow 1 kg?? That's huge! 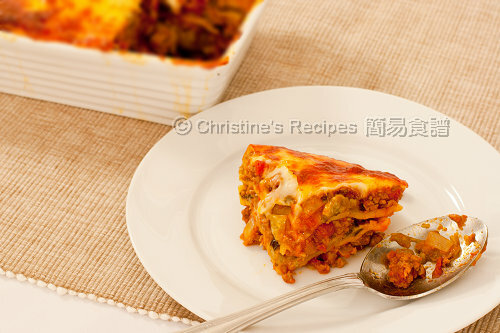 A wonderful looking lasagna, I like the eggplant here, delicious! What a delicious looking lasagne. When we moved to the US, we also noticed that everything was larger. An example would be that we can buy apples the size of a rice bowl! That eggplant is gigantic! I should use light sauce and try it out. that eggplant lasagne is too scrumptious ! The eggplant makes the lasagna extra moist too, I believe..? nice picture you have been putting up but my outcome is never as nice as yours. Instant pasta sheets does not need to b pre soaked as long as the meat sauce or cheese sauce covers it when u r laying the pasta & sauce together b4 baking. Love ur Umami take on things, asians have msg & italians have Parmesan cheese. That is one big eggplant! I'm going to try and make this. It's a little like moussaka, and I can tell it will taste amazing! We tried your eggplant lasagna and my family enjoyed. Thanks for sharing your recipe. This is an excellent recipe - I've made this dish several times now. You can use rice vinegar instead of ketchup if you like. 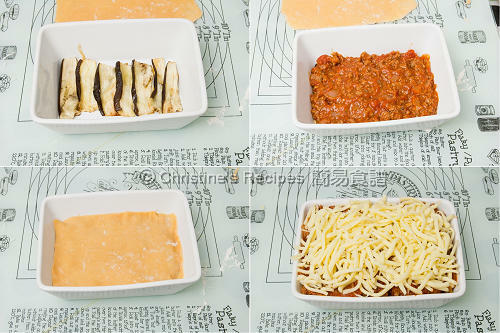 When pre-baking the aubergine/eggplant, just use the same dish that you'll be using for assembling the lasagna. One less item to wash up. can i actually dun add the raw sugar & use caster sugar instead?? Yes, caster sugar, or regular white sugar will work as well. Thanks for dropping by. Glad that your family loved this Asian twisted dish. Is there any other sauce can replace the worcestershire sauce? Sorry, no substitute for Worcestershire sauce. It helps enhance the flavour of the meat. You can skip it if you don't any.